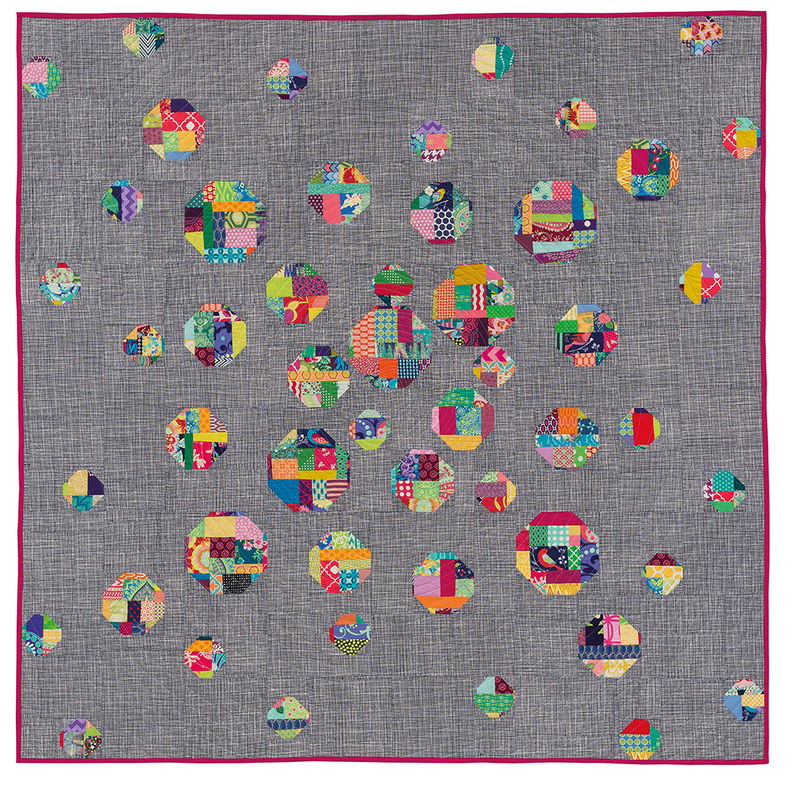 Today's stop on the Stash Statement blog tour features the Murrina quilt, and I'm so excited to share it with you. I traveled to Italy in college, and fell in love with the artistry in the small glass pendants created there, called Murrina. They are unlike any other kind of jewelry and the details in each piece are truly spectacular. They are also known as millefiori, or one-thousand flower pendants, and are actually the inspiration behind many English Paper Piecing projects we see in the quilt world today. When I designed this quilt, I wanted to capture the charm of those gorgeous glass pieces, but without hand sewing (because you know I hate that). These Murrina are the perfect little gems for showing off your cherished fabric bits. They look like they are exploding from the center and floating out toward the edges of the quilt, which is such a neat effect. 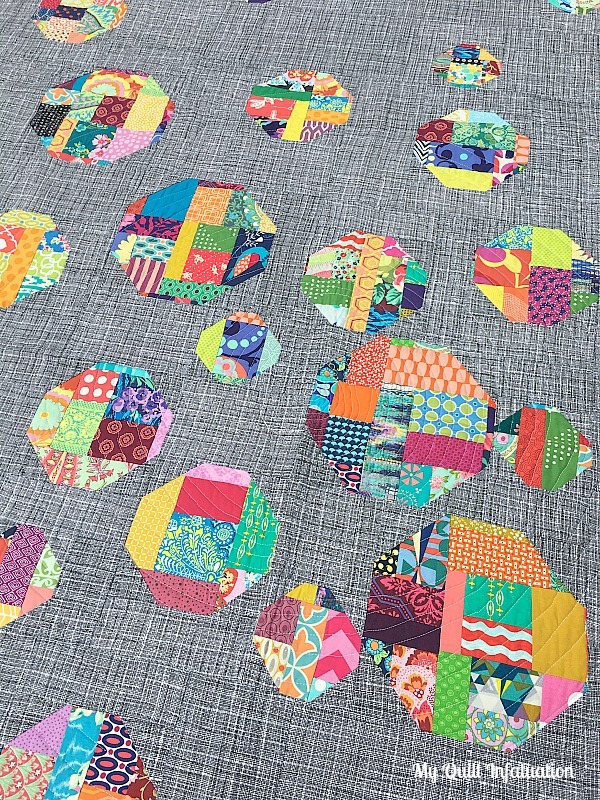 Though others on the blog hop have used prints in the background, this is the only quilt shown in the book that has a print background, and the black and white crosshatch gives such a great backdrop for the improv snowballs. I quilted this one with a giant spiral using 50 wt. Aurifil White, and the spiral is slightly more dense in the center which adds to the floaty look. On the back, I used a nice, bright floral with a coral pin dot strip to widen it out. 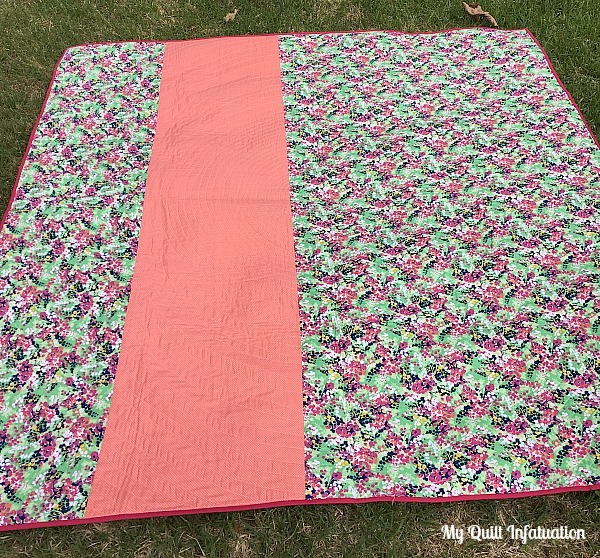 I had a tough time deciding on the backing for this quilt because there are so many colors in the scraps, but it compliments the front well and I really love how it turned out! The Kona Pomegranate binding adds a perfect pop against both the floral backing, as well as the crosshatch background. 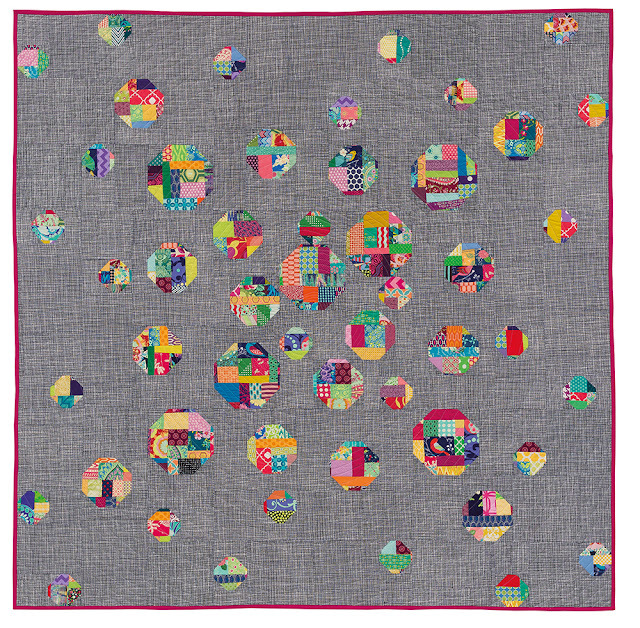 You might be surprised to learn that the Murrina quilt is created with just nine big blocks. It really is much easier than it appears, and it creates a real statement! Yvonne at Quilting Jetgirl and Leanne at Devoted Quilter each made their own version of the Murrina quilt, and I love the personal touch each put on the pattern. I know you don't want to miss them! 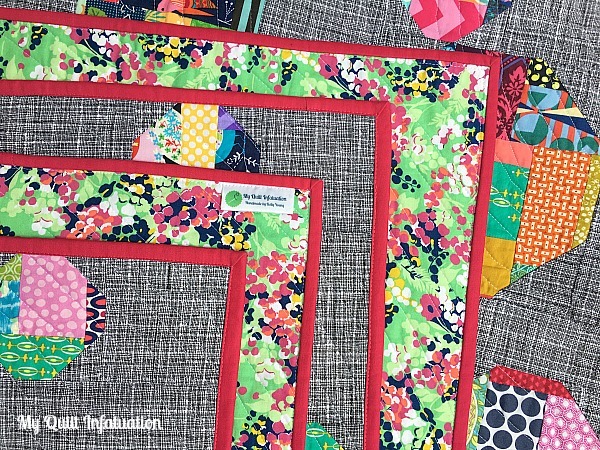 After checking them out, be sure to get your own copy of Stash Statement, and you'll be well on your way to making these unique quilts with your treasured scraps. You can get a signed copy of Stash Statement in my Etsy shop HERE, which includes the free bonus pattern, Take Flight. You can also find it on Amazon, Connecting Threads, or ask about it at your local quilt shop. Here's the full lineup for the Stash Statement blog hop, and you will definitely want to stay tuned for the awesomeness being shared every Monday! Thank you so much. I'm happy you like it. It is a fun pattern! Kelly, Murrina is beautiful! I loved Yvonne and Leeanne's versions of them, too. Each Monday, as I've read your posts and the guest bloggers, I've gone back to my copy of the book to read about that quilt was made. Now I want to make each of them! Thank you Diann! I am glad you like it. I do hope you try some of the others. I love the thought of the Murrina gems exploding from the center and floating to the edges. It was such a delight and treat to make a version of Murrina! Thank you, Yvonne! I'm glad you enjoyed the pattern. Your version is so lovely! Thank you so much, Deb! I'm so happy you like the book, and this quilt. 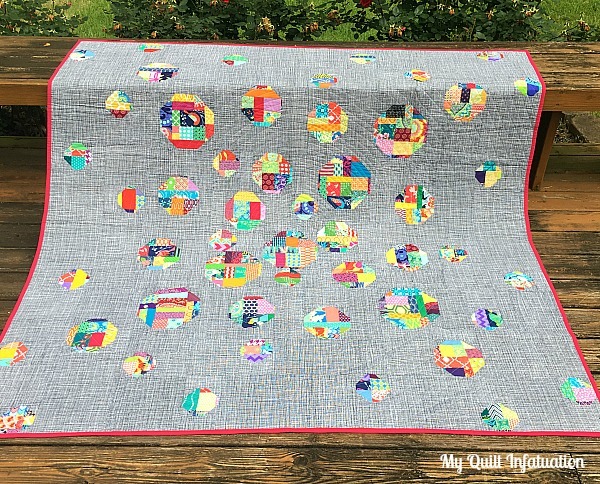 My goal was exactly that- to give quilters a fun, easy way to use up their scraps, resulting in truly unique quilts. Love the multi colored feel of this one. It feels happy to me. Thank you so much, Anne! I wanted to design a happy and carefree quilt with this pattern, so I'm glad you think it is! I really like this one! You have such great talent! Thank you so much, Sarah! That is so kind of you. I'm happy you like it! Wonderful!! I know the blog hop is stretched out over a long period of time, but I really like only have a few blogs to read each week. As a reader, I appreciate it, and it allows me to actually read each blog post. I'm so glad, Anja! I worried about stretching it out at first, but I think it has worked out well. This time of year is just so busy, I think the quilts/posts might have gotten lost in the shuffle if I had made the blog hop only a couple of weeks long. Thank you so much, Preeti! I think that would look amazing.